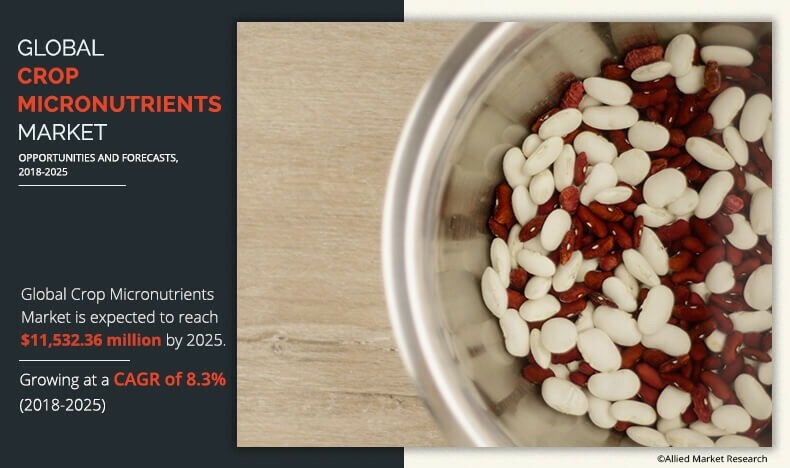 The global crop micronutrients market was valued at $6,077.05 million in 2017, and is projected to reach $11,532.36 million by 2025, registering a CAGR of 8.3% from 2018 to 2025. Crop micronutrients are essential nutrients required by plants for growth and other metabolic activities. They play a major role in improving quality, color, taste, efficiency of fertilizers, water use, disease resistance, and others. They also aid in the development of large as well as strong roots, help build complete proteins and compounds, and promote better plant immunity. Factors such as effectiveness of micronutrients for crop yield and productivity, increased awareness among growers about the benefits of micronutrients and shrinkage of agricultural land, are driving the global crop micronutrients market. However, mining of micronutrient reserves, availability of cheap alternatives and counterfeit products, and lack of awareness among farmers regarding dosage and proper application of micronutrients are the restraining factors for the crop micronutrients market. The report on the global crop micronutrients market is segmented based on form, product type, crop type, application, and geography. 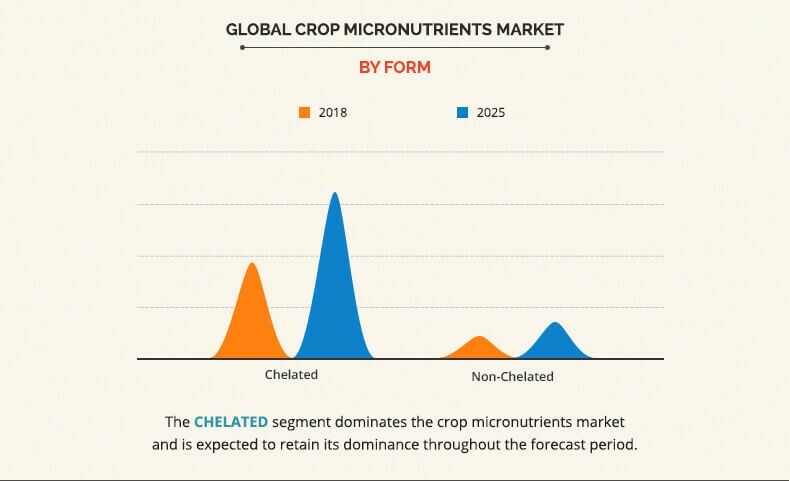 Based on form, the global crop micronutrients market is bifurcated into chelated and non-chelated micronutrients. According to product type, it is segmented into boron, copper, iron, manganese, molybdenum, zinc, and others. Based on crop type, the global crop micronutrient market is classified into cereals & grains, fruits & vegetables, pulses and oilseeds, others. By application the report is segmented into fertigation, soil, foliar, seed treatment, and others. Geographically, the market is analyzed across North America, Europe, Asia-Pacific, and LAMEA. Asia-Pacific was the largest market for crop micronutrients in terms of both value and volume in 2017. Growth in interest for high-quality food and rise in awareness and acceptance of micronutrients by farmers in the emerging economies of Asia Pacific are some of the major factors driving the crop micronutrients market in this region. In addition, the increase in agricultural practices and necessity of high-quality agricultural produce are anticipated to drive the crop micronutrients market in this region. The chelated micronutrients segment was the highest contributor to the crop micronutrients market in 2017, and is projected to grow at a CAGR of 8.7%. Chelated micronutrients are widely used in agriculture and are strongly promoted by the fertilizer industry. It refers to inorganic nutrients that are enclosed in an organic molecule. Chelated compounds are more stable than non-chelated compounds. Therefore, they are widely used in agriculture as micronutrient fertilizers to supply plants with Iron, Manganese, Zinc, and Copper. The most common chelates used in agriculture are EDTA, DTPA, and EDDHA. 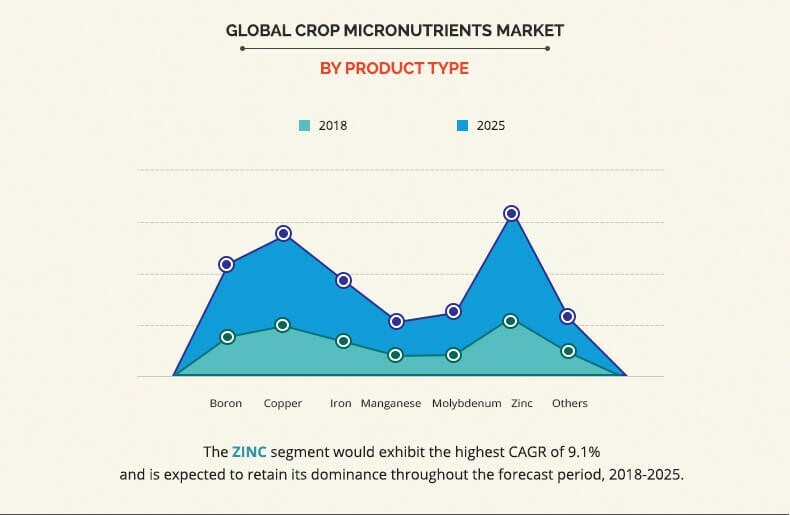 In 2017, the zinc segment accounted for the highest share of the crop micronutrients market in terms of value. Zinc plays an important role in the growth of plants as it regulates auxin, a vital growth hormone in pollen formation. It also acts as an enzyme activator in protein synthesis and is involved in the regulation and consumption of sugars which enhance the global zinc consumption in crop micronutrients. The cereals & grains segment is projected to grow at the highest rate as cereals are the most widely consumed crop across the globe. The consumption of food is on the rise due to increase in population and rise in economy in the developing countries. It is therefore important to maintain the nutrient level in cereal crops & soil to enhance the productivity and growth of the cereals, for which micronutrients play an important role. The key players operating in this market are Akzo Nobel N.V., Aries Agro Ltd., Baicor, L.C., BASF SE., Compass Minerals International, Inc., DowDuPont Inc., The Mosaic Company, Nutrien Ltd., Western Nutrients Corporation, and Yara International. The study provides an in-depth analysis of the crop micronutrients market with current trends and future estimations to elucidate the investment pockets. A comprehensive analysis of factors that drive and restrict the growth of the crop micronutrients market is provided. The report includes a detailed analysis of the regional as well as global market, key players, market segments, application areas, and growth strategies. 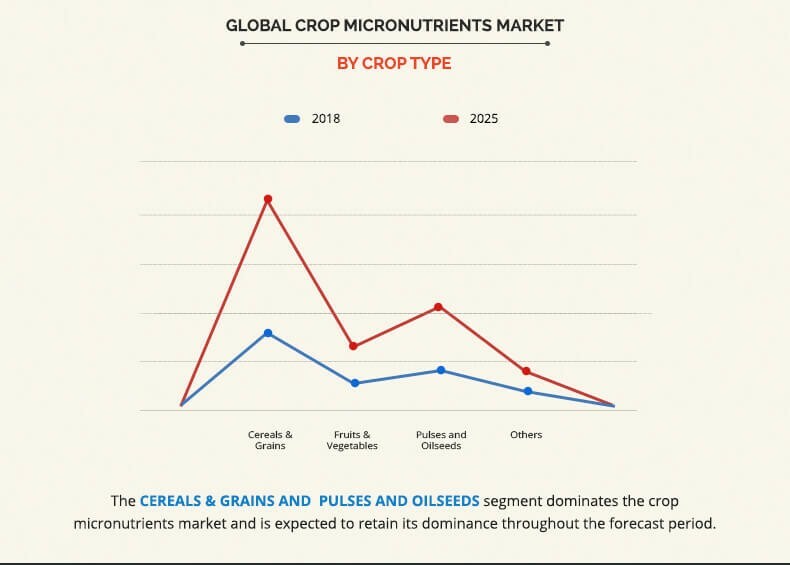 Key players are profiled and their strategies are analyzed thoroughly, which predict the competitive outlook of the crop micronutrients market. Crop micronutrients are increasingly deployed in the agricultural production business to enhance the nutrient level in crops & soil, improve the productivity and growth of crops. Factors such as demand for quality and uniform crop yield to cater to the rise in demand for food, shrinkage in cultivable land, and growth of agriculture industry across the globe are fueling the growth of the global crop micronutrients market. Rise in awareness regarding the benefits of crop micronutrients, increase in farm expenditure, ease of application, and effectiveness of micronutrients for crop yield and productivity have fueled the popularity of crop micronutrients among farmers in the recent years. Increase in demand for biofuels have also supported the crop micronutrients market growth. However, the use of micronutrients depends on several factors such as soil type, crop system, local environmental conditions, and economic factors. Thus, inadequate knowledge regarding dosage and proper application of micronutrients are the major factors expected to restrain the growth of the market. 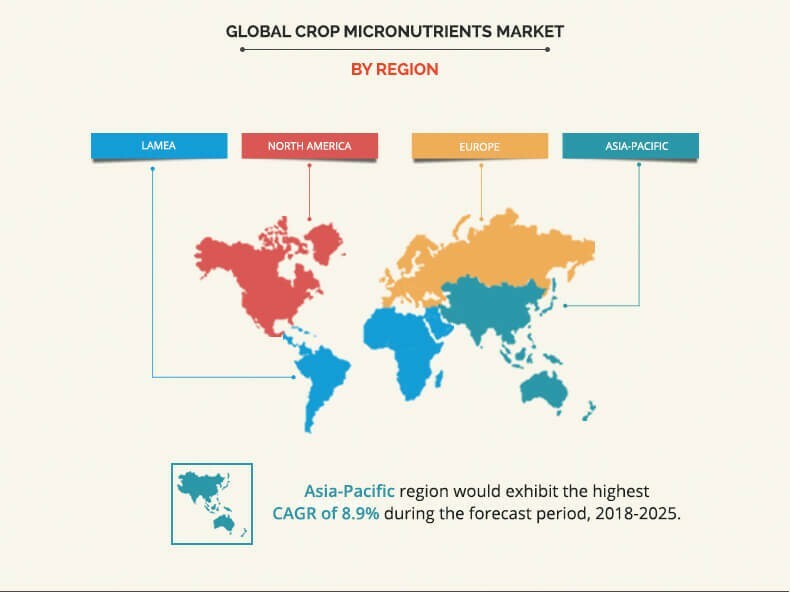 The Asia-Pacific crop micronutrients market offers lucrative opportunities for key manufacturers, owing to its growth in economy with a large population base and the increase in agricultural practices. Several companies are proactively investing in their development and business expansion to effectively cater to the needs of the consumer and tap the emerging markets. For instance, Aries has expanded its global reach by utilizing the manufacturing facilities in the U.A.E. with 2 manufacturing units located at Sharjah (for Chelated Micronutrients) and Fujairah (for Sulphur Bentonite) to cater to the growing demand from the region. Furthermore, investments initiatives by the government and private manufacturers facilitate development activities and new product developments, thus boosting the market growth.